As an American soldier stationed in France from 1917 to 1918, Frank Steed immersed himself in the culture surrounding him. His personal scrapbooks, which memorialize his experiences in World War I, include opera programs, theater playbills, and guides to tourist sites. War did not stop culture in France, nor in Steed’s home country. Day-to-day life went on despite worldwide warfare. In America, trends in music, dance, and fashion were in flux. Some social activities were paused as the Great War raged, while others evolved. WWI had a profound influence on its contemporary culture, as the conflict and its soldiers were represented in the popular culture of the day. This was a period of cultural transition. During World War I, many Americans relied on popular culture to make sense of global affairs. World War I was a transition point for two popular forms of music. The pre-war years were marked by ragtime while the post-war years gave birth to the Jazz Age. Both styles grew from African American traditions and are a direct result of African American contributions. Ragtime became popular in the 1890s and reigned until the late 1910s. After the close of the war, jazz replaced it as the dominant style of popular music. While ragtime was fading into jazz, war songs were the most prevalent form of popular music. Even before the United States officially entered WWI, the conflict was inspiring music. From 1917-1919, these types of tunes were the pop anthems of the day. In general, they were more like patriotic odes than protest songs. Their moods range from jubilant (“Over There”) to hesitant (“Don’t Send My Darling Boy Away”) to anti-German (“Bing! Bang! Bing ‘Em on the Rhine”). Other songs depict the everyday lives of soldiers, such as Irving Berlin’s “Oh How I Hate Getting Up In the Morning” and “I Don’t Want to Get Well,” a duet by Arthur Fields and Grace Woods. Love is another common theme. In songs like “If He Can Fight Like He Can Love, Goodnight Germany,” female performers sing to their sweethearts overseas. Some songs give a voice to women’s wartime roles overseas. In “Oh Frenchy,” an American nurse serving in Paris falls in love with her patient. War songs came from many points of view and reflected a unique mixture of sentiments. These are just a few examples from a musical movement that created a massive song library. Ragtime was the pre-war dance craze. The style developed on dance floors across the United States as a response to the ragtime trend in popular music. Irene and Vernon Castle are credited with introducing the style overseas during their 1911 honeymoon in Paris, making ragtime a worldwide phenomenon. Popular dances within the ragtime movement include the Fox-Trot, the Tango, and the One-Step. By 1915, ragtime dance’s popularity dwindled. With men overseas in combat, dance floors quickly became deserted. Social dance picked up again in 1919 after fighting had ceased. However, ragtime was seen as old-fashioned, a relic from a distant and innocent pre-war past. The Jazz Age ushered in new dance crazes, most notably the Charleston. However, the Fox-Trot and the Tango continued to enjoy popularity and saw updates that kept them current to post-war dancers. Silent films were a popular form of entertainment in the 1910s. To avoid being deemed a “nonessential industry” by the government, the National Association of the Motion Picture Industry partnered with the federal government and agreed to aid the war effort in any way possible. Not all movies produced during the war years centered on WWI. Many love stories, comedies, and dramas make no reference to the war, and westerns remained a popular genre. Patriotic tales became more prevalent by 1917. Love affairs were often metaphors for the war, as in 1917’s The Little American. Set explicitly in WWI, popular movie star Mary Pickford played an American nurse serving in France who fell in love with two men: a French soldier and a German soldier. War films could also take on a comedic tone. Charlie Chaplin’s Shoulder Arms was notable for satirizing the war as a whole, mocking Germans, Americans, and the culture of warfare. Ultimately, the film industry benefited from World War I as a result of its partnership with the federal government and the positive, patriotic reputation it gained in the eyes of Americans. Even as the film industry took off, vaudeville remained popular during WWI. It became part of the war effort as performance troupes volunteered to travel overseas and put on live shows for soldiers. During World War I, many men and women decided that dressing in a gaudy, elaborate manner was inappropriate considering global affairs. As a result, very little innovation occurred in fashion for either gender during the war years. That doesn’t mean that fashion was completely stagnant. Women adapted current styles to make them more functional for their wartime work, phasing out fads like double-skirts and dressing to a more tailored look. Clothing became more practical and comfortable. In the post-war years of the Jazz Age, fashion for fashion’s sake found it voice again. In the 1920’s, women would begin to push the boundaries of socially acceptable dress. Sports had a waning influence during the war years. 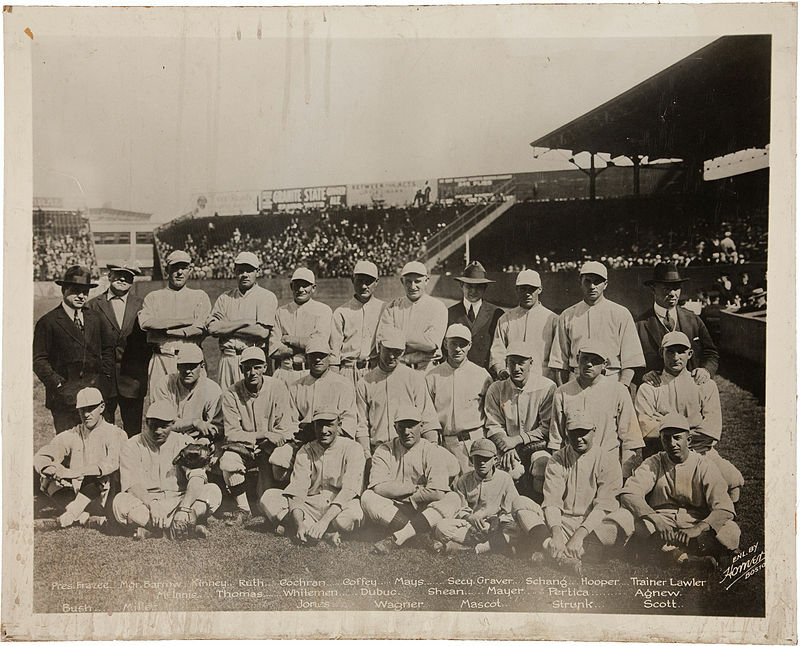 In the United States, most professional sports teams shut down due to World War I. Athletic men were needed for the war effort. “Work or fight” orders compelled professional athletes to join the military. Public opinion turned against athletes who chose to stay in the United States and play ball rather than join their fellow countrymen in combat. Professional baseball came under scrutiny when both the American and National Leagues decided against suspending their 1918 seasons. Game play was paused indefinitely on September 2, 1918, after the Boston Red Sox defeated the Chicago Cubs, but only for a few months as the war ended the following November. Despite the negative effects this controversy had on professional baseball’s reputation, attendance increased by over 50% during the 1919 season. This suggests that post-war Americans were eager to return to life and leisure as usual. Berlin, Edward. “Ragtime.” Encyclopedia of African-American Culture and History 2006: 1872-1875. Berlin, Irving. “Oh How I Hate To Get Up in the Morning.” 1918. https://archive.org/details/VirvingBerlin-OhHowIHateToGetUpInTheMorning. “The Castle Walk (1915).” Youtube video, 1:13. Posted March 1, 2013. https://www.youtube.com/watch?v=Lms5OxZlGBw. “Charles Chaplin – Shoulder Arms.” Youtube video, 44:53. Posted December 15, 2013. https://www.youtube.com/watch?v=rj6DIm119-g.
Hensler, Paul. “”Patriotic Industry”: Baseball’s Reluctant Sacrifice in World War I.” NINE: A Journal of Baseball History and Culture 21, no. 2 (2013): 98-106. Horner, Carl. 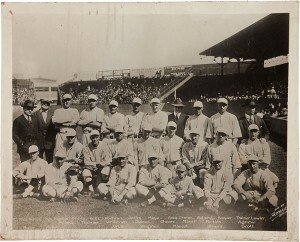 “1918 Boston Red Sox.” Heritage Auction Gallery, licensed under Public Domain via Commons. https://commons.wikimedia.org/wiki/File:1918_Boston_Red_Sox.jpg#/media/File:1918_Boston_Red_Sox.jpg. Keil, Charlie, and Ben Singer. American Cinema of the 1910s: Themes and Variations. Piscataway: Rutgers University Press, 2009. Murray, Bill. “Over There.” 1917. https://archive.org/details/BillyMurray-OverThere1917. Paris, Michael. The First World War and Popular Cinema: 1914 to the Present. New Brunswick, N.J.: Rutgers University Press, 2000. “Popular Songs of WWI.” USCB Cylinder Audio Archive. University of California Santa Barbara Library. http://cylinders.library.ucsb.edu/wwi-radio.php. Powers, Richard. “Dance in the Jazz Age.” Stanford University. https://socialdance.stanford.edu/Syllabi/jazz_age.htm. Powers, Richard. “Social Dances of the Ragtime Era.” Standford University. https://socialdance.stanford.edu/Syllabi/ragtime_dance.htm. Laver, James. The Concise History of Costume and Fashion. New York: Scribner, 1969. Ritzenhoff, Karen A., and Clémentine Tholas-Disset. Humor, Entertainment, and Popular Culture During World War I. New York: Palgrave Macmillan, 2015. Campbell, Donna. “Brief Timeline of American Literature, Music, and Movies 1910-1919.” Washington State University. http://public.wsu.edu/~campbelld/amlit/1910m.html. Golden, Eve. Vernon and Irene Castle’s Ragtime Revolution. The University Press of Kentucky, 2007. Layson, Hannah and Patricia Scanlan. “World War I in Popular Culture.” The Newberry. http://dcc.newberry.org/collections/world-war-i-in-us-popular-culture. Watkins, Glenn. Proof Through the Night: Music and the Great War. Berkeley: University of California Press, 2002. Edward Berlin, “Ragtime,” Encyclopedia of African-American Culture and History 2006: 1872-1875. “Popular Songs of WWI,” USCB Cylinder Audio Archive, University of California Santa Barbara Library, http://cylinders.library.ucsb.edu/wwi-radio.php. Richard Powers, “Social Dances of the Ragtime Era,” Standford University. Michael Paris, The First World War and Popular Cinema: 1914 to the Present, New Brunswick, N.J.: Rutgers University Press, 2000, 147. Charlie Keil and Ben Singer, American Cinema of the 1910s: Themes and Variations, Piscataway: Rutgers University Press, 2009, 187. Charlie Keil and Ben Singer, American Cinema of the 1910s: Themes and Variations, Piscataway: Rutgers University Press, 2009, 211. Karen A. Ritzenhoff and Clémentine Tholas-Disset, Humor, Entertainment, and Popular Culture During World War I, New York: Palgrave Macmillan, 2015, 169. James Laver, The Concise History of Costume and Fashion, New York: Scribner, 1969, 229. Paul Hensler, “Patriotic Industry”: Baseball’s Reluctant Sacrifice in World War I,” NINE: A Journal of Baseball History and Culture 21, no. 2 (2013): 98-106. “1918 Boston Red Sox” by Carl Horner, Heritage Auction Gallery, licensed under Public Domain via Commons – https://commons.wikimedia.org/wiki/File:1918_Boston_Red_Sox.jpg#/media/File:1918_Boston_Red_Sox.jpg.